One of the City’s most famous landmarks, Norwich Castle was built by the Normans as a Royal Palace 900 years ago. Used as a prison from the 14th century, the Castle became a museum in 1894. Now the County’s principal museum, the Castle is packed with treasures to inspire and intrigue visitors of all ages. Its outstanding collections of fine art, archaeology and natural history are of national importance and include the best collections anywhere of paintings by the Norwich School of Artists and the world’s largest collection of ceramic teapots. On the W. side of the Wensum river, which bounded the olcl city on the N. and E., a hill rises from Bracondale towards the N.W., Ber Street following the centre of its slope, until at the summit there is a steep crest which has been scarped around, and from which the descent is precipitous, entailing steps in the streets on the N. and W. sides. Here was the great stronghold of the Iceni, the valiant opponents of the Romans in the time of Nero ; they in all probability formed the circular rampart on the hill with the mound, upon which, a thousand years after, the Normans reared the present castle. The earthworks forming the stronghold were quite of the same character as those of Castle Rising and Castle Acre, of Clare in Suffolk, Hedingham in Essex, and many others. The castle must have been built early in the reign of William I., since, in 1074, Ralph de Guader, Earl of the East Angles, was attacked here by the King’s forces. The circumstances are notable, as they led to the destruction of the great Earl Waltheof, the last hope of the Saxons of England. De Guader being refused permission to marry the sister of FitzOsborne, Earl of Hereford, carried out the bride-ale party all the same, and assembled his friends in this castle, of which he was constable, when a revolt was plotted against William, who was absent in Maine. Waltheof, being present, promised his concurrence, but soon after altering his mind, took into his confidence his wife Judith, the Conqueror’s niece, who having set her affections on some-one else, took this opportunity to ruin her husband, and betrayed him to William. Waltheof, although he had renounced the plot and made his peace, as he thought, with the King, was, by his wife’s agency, brought to the block at Winchester and beheaded, to the lament of the English. William’s forces soon quelled the insurrection, which was hastily carried out; de Guader fled to sea on their approach, leaving Norwich Castle to be defended by his countess, who, however, made terms with the besiegers, and surrendered her charge. In 1087, on the occupation of the throne by the Red King, a confederacy of barons was formed against him, abut Roger Bigod seized this castle, and used it for the spoliation of the country in its vicinity. When the King had recovered it he granted it to Richard de Redvers, Earl of Devon. Then Hugh Bigod, Earl of Norfolk, in 1136, upon a rumour of the death of Stephen, took forcible possession of the castle, but when the King came against him in person, he yielded it on summons, and Stephen gave it to his son,William de Blois, Earl of Mortaigne, who, however, was turned out of it by Henry II. in 1155. In 1216, when the Dauphin was called over to the assistance of the Barons against John, he came to Norwich, and placed a garrison in the castle, which he had reduced with considerable trouble (Non parvo negotio: Polydore Virgil) ; and on his retirement he delivered the castle to Hugh Bigod. During the early years of the reign of Henry III. 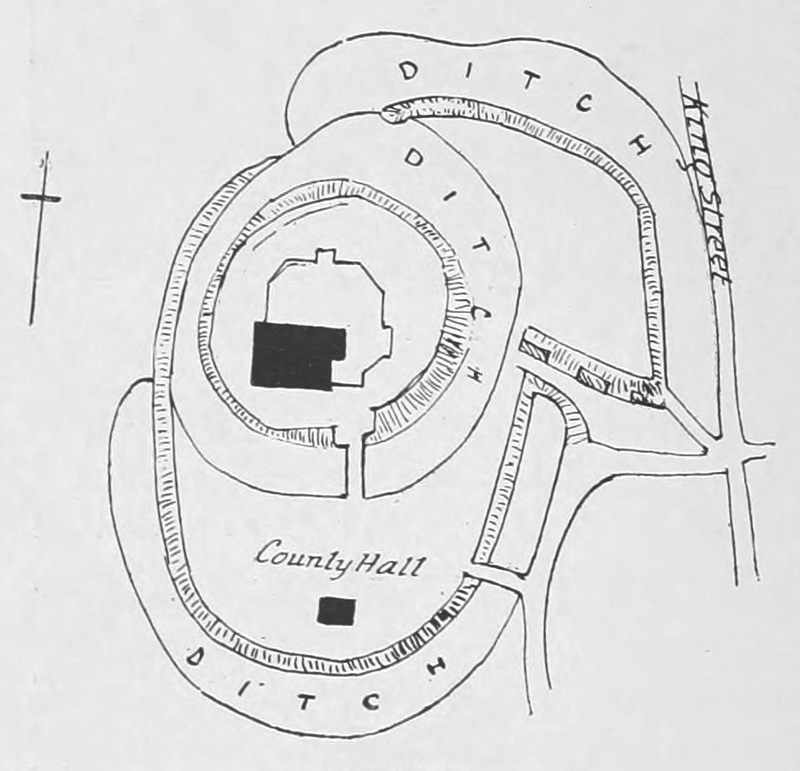 Norwich Castle was made use of for a county gaol, and in the succeeding reign State prisoners also were placed there; and, indeed, this appears to have been the use to which Norwich has been subjected for more than 650 years, since it was only in 1884 that the fabric was purchased by the Town Council, and has since been converted into a Museum. The Bigods, Earls of Norfolk, became extinct (25 Edward I. ), when the castle was held by the Crown. In 46 Edward III., it is mentioned as a Royal castle, but in so ruinous a state from neglect that no one could live in it. No historical occurrence of importance is chronicled as having taken place at Norwich Castle. 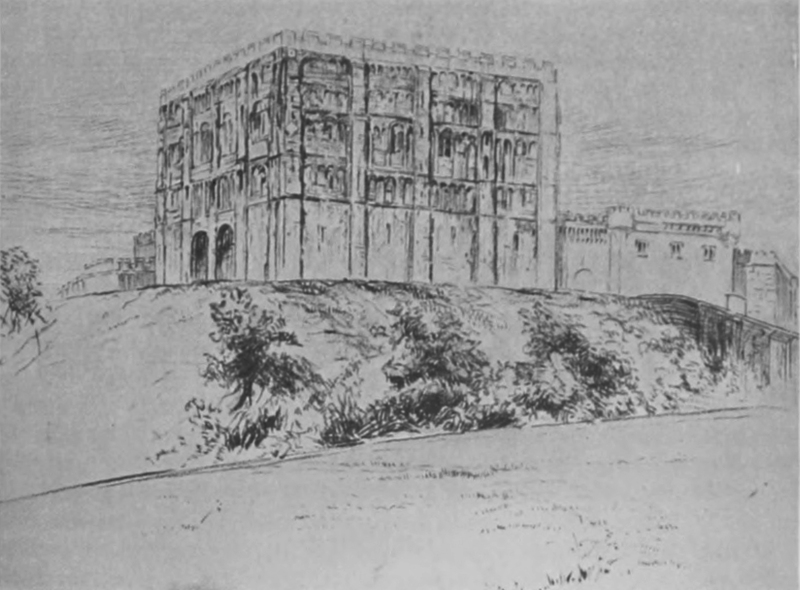 In Edward VI.’s reign (1549), the insurrection in favour of the ancient creed, headed by the tanner, Kett, grew to dangerous proportions, but the Earl of Warwick put the rebels to flight with a strong body of troops, and Kett was hanged from the battlements of Norwich Castle. The keep is nearly a square, measuring 96 by 92 feet, and about 76 in height. The quoins are formed of pilasters which embrace the angle, and the faces of the tower are divided by narrow pilasters which reach also to the battle¬ments. The basement storey was quite plain, and was anciently faced with flints; above this the whole wall is ornamented with arcades in relief of Norman work almost to the summit.